This invitation is subject to discontinuation by the vendor. Please Contact Us for assistance prior to ordering. This exceptional Bat Mitzvah invitation is raised printed on premium White Vellum card stock that is framed by Hot Pink Neon stock which is placed over a wide diagonal strip of Celestial-patterned stock. 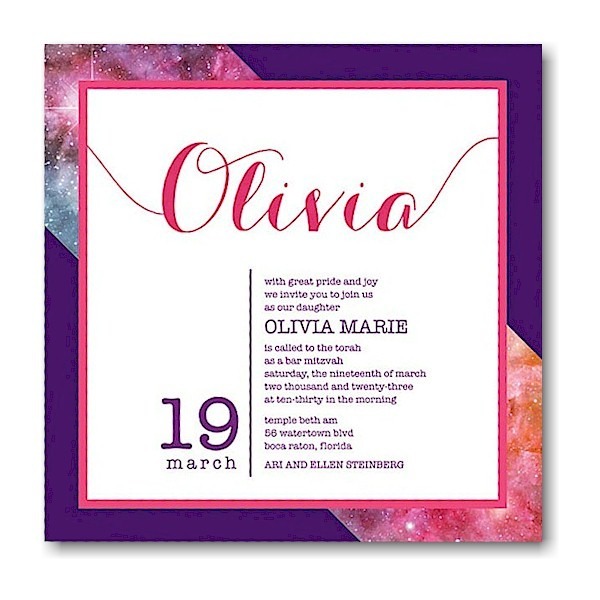 This exceptional Bat Mitzvah invitation is raised printed on premium White Vellum card stock that is framed by Hot Pink Neon stock which is placed over a wide diagonal strip of Celestial-patterned stock. Violette Shimmer card stock is the base layer. The name of the Bat Mitzvah may be placed at the top in Jumbo letters. Your wording will be arranged as shown. Measures 7″ square. Shown with Fuchsia/Violette inks and lettering styles Carolyna Pro Black/American Typewriter. The Reception and Response enclosures will print on single Bright White Vellum stock and the Thank You notes will print on folder stock. This Bat Mitzvah invitation comes with single bright white envelopes. Please note: Due to the square shape of this invitation, additional postage is required. Consult your local post office for details prior to mailing. Envelopes can be lined for an additional charge of $62 per 25. A verse or printing inside (or below) is available on thank you notes for an additional charge of $54.